Sometimes browsing the Internet, from all your favorite websites to the endless list of “must-have” social networks, can be exhausting. If only there were a tiny robot that lives in your house that would do all the work for you, and just give you a little printout of the most important bits. Well, now there is. Say hello to Little Printer. 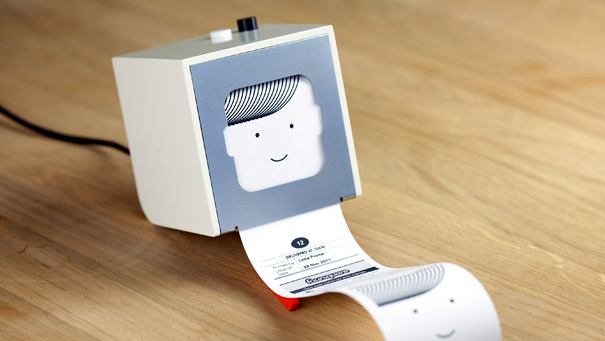 Developed by the London-based design studio Berg, Little Printer connects to the Internet via the “Berg Cloud” (Berg’s network for controlling the “smart” inanimate objects of our future), and is controlled entirely using a smartphone app. According to Berg’s announcement, Little Printer “lives in your front room and scours the Web on your behalf, assembling the content you care about into designed deliveries a couple of times a day.” This delivery comes in the form of a piece of paper that is, essentially, exactly the same as the receipt you get at a store. But instead of a list of your purchased items, you get short news briefs, social network status updates from your friends, crossword puzzles and to-do lists. Each printout is even topped-off with a little smiley face with Justin Bieber hair at the end. 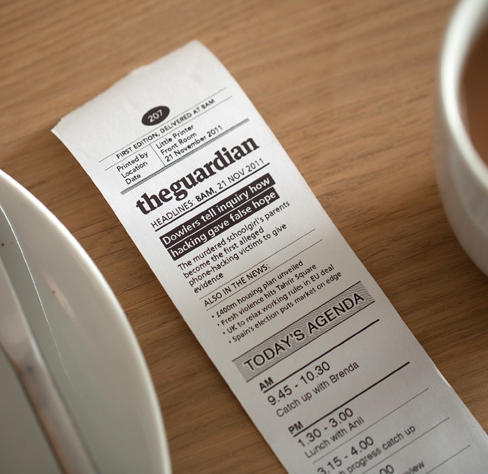 When Little Printer becomes available in 2012, it will have access to customized updates from Arup, Foursquare, Google, the Guardian, and Nike. Berg says it is working to bring more publishers on board for a later date. We love physical stuff. Connecting products to the Web lets them become smarter and friendlier – they can sit on a shelf and do a job well, for the whole family or office – without all the attendant complexities of computers, like updates or having to tell them what to do. Little Printer is more like a family member or a colleague than a tool. Plus paper is like a screen that never turns off. You can stick to the fridge or tuck it in your wallet. You can scribble on it or tear it and give it to a friend. Little Printer certainly is nifty. And little. But do we really need to have more little scraps of paper to deal with? Isn’t going paperless one of the great things the Internet allows? We thought so. Apparently we were wrong.